How to easily influence your Google rankings? Google rankings may seem like a mystery for most of us. All we know is that we mostly get the results that we need when we ‘Google’ something. How this works is not totally clear, but luckily for website owners there are now some ways for you to influence your Google rankings to your advantage. In this mini-guide we’ll try to explain the basics of this enormous network of algorithms, tricks, ranking factors, SEA and SEO. Basically, you can divide Google ranking into two big departments: SEA and SEO. These two departments are very different from each other but also work very well together. SEA is short for ‘Search Engine Advertising’, which means that you pay for your fixed ranking in the Google rankings. Although this can be very effective, we prefer to spend more time SEO. SEO is short for ’Search Engine Optimization’ and this gives you an avenue to influence your Google rankings without paying a dime. This is not an exact science but when practiced the right way it is mostly more effective than SEA. TThe difference between SEO and SEA is also very visible in the Google rankings. SEA are paid advertisements and to show this to search engine users, Google notes this with the yellow ‘Adv.’ you can see in the picture below. You can choose which search phrase you want to rank on and Google will place you at the top or on the right of the search engine results. SEO is a bit more complicated. If Google rates you as the most relevant website for a certain search phrase, you’ll end up on the first page of the Google search results. Studies have shown that most people don’t even look at the second or third page in Google, so ranking high in the organic search result is a must if you want to have more visitors through the search engines. Like we said before, search engine optimization is no rocket science. Google tries its best to make their algorithms less influenced by tricks like keyword stuffing and gathering false incoming links. To understand how SEO works around these measures that Google has taken to make their search results as reliable as possible, you have to understand the principle of the ‘ranking factors’. Ranking factors are the factors that Google base their algorithms on, according to the most reliable SEO experts. 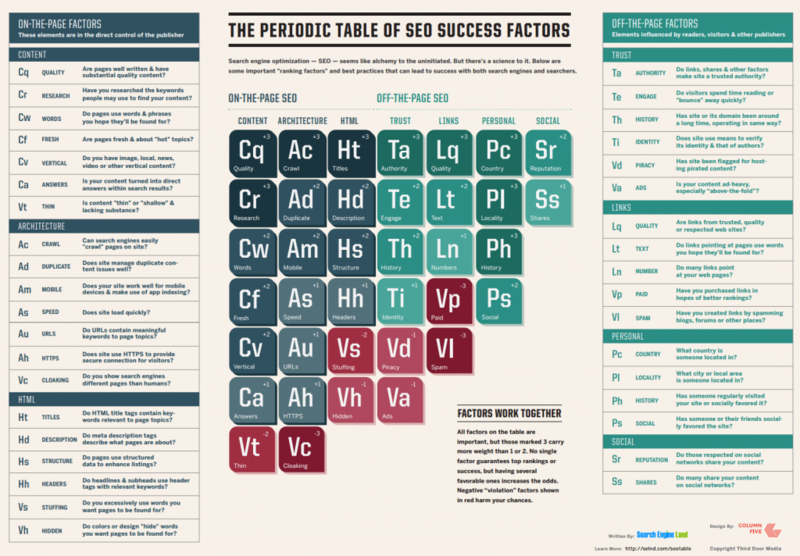 To give you an insight look on these ranking factors we’ll use ‘The Periodic Table of SEO Success Factors’ from Search Engine Land. This map shows exactly which factors influences the search engine rankings and how you can influence these factors to manipulate the ranking of your site. As you can see in this periodic table, the ranking factors are divided into on-page SEO and off-page SEO. Each of these have their own ranking factors that are measured by multiple elements. In the On-page SEO you have to deal with factors like: content, architecture and HTML, while in the Off-page SEO the ranking factors are trust, links, personal and social. When you understand these elements, you’ll be able to predict their outcome and sooner or later you’ll see the results in your personal Google rankings! If you want to make sure that you don’t miss any of these on-page ranking factors, you should start your free webtexttool trial today. 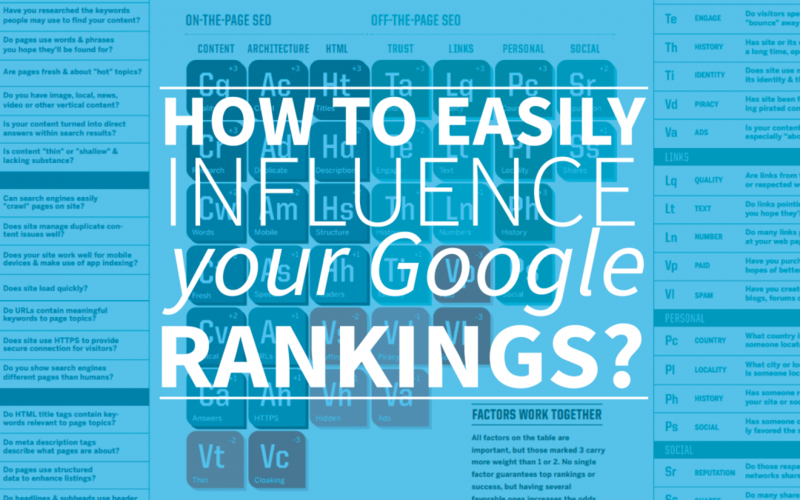 This tool helps you to understand what to do to influence your Google rankings the right way.